Singapore can be a frustrating market for hotels, at least as far as redeeming miles and points are concerned. Most chained hotels are in the $300/night range, a level where I think it’s a bit too expensive to pay cash outright, but using points isn’t exactly the best value either. For that reason, I looked to American Express’s Fine Hotel & Resorts program when I was booking my one-night stay in Singapore. I ended up finding a pretty decent deal at the Four Seasons Singapore, which was going for about $275 a night. However, since I was booking through American Express FHR, I also received a $100 dining credit. Now, I don’t really value that at face value, but it does bring the effective cost down a bit. I arrived at the hotel in late afternoon, after a ~30-minute car ride from the airport. The Four Seasons Singapore is located on a little side street off Orchard Road. This makes for convenient access to Orchard Road for those interested in shopping, but the fact that it’s not on Orchard Road means decent privacy as well. I was greeted by a bellhop, and made by way to the hotel front desk, which was located at one corner of the lobby. I walked passed the grand staircase, which was accompanied by a sculpture of sorts. The lobby was beautiful, and decorated in a very classically luxurious way. There were various floral arrangements on accent tables, which I always appreciate. Something about fresh flowers just makes a place welcoming and calming. Off to the side of the reception was a wall of world clocks. I am always fascinated by the countries a given hotel or airport chooses to display the time for. On the opposite end of the reception desk was a library, which was warmly decorated and had some very comfortable couches. It was the perfect place to wait for a ride or for your companions. An associate quickly checked me in, and explained all the benefits that came with my booking, which was made through American Express Fine Hotel & Resorts. As is usually the case, there was also a letter detailing the benefits, and a survey from American Express. The associate didn’t mention anything about an upgrade, but it wasn’t really a big deal. From what I could tell, the non-suite rooms at the Four Seasons Singapore are mostly categorized by size, ranging from ~400 to ~600 square feet. The elevator bay once again had a console table with fresh flowers, and I walked through a long hallway accented with artwork to my room. My hotel room was spacious, and I was greeted with a small vanity table as soon as I walked in. I don’t often see dedicated vanity tables in non-suite hotel rooms; a lot of times they are simply built into the vanity in the bathroom by way of adding a chair, or simply omitted. I mostly used it as an entryway table to unload all my bits and pieces every time I returned to my room, though I am sure others will appreciate it for its intended purpose. I had reserved a King room, which was delivered as promised. On one of the night stands were a telephone, a writing kit, and master controls for the room. The controls were fairly basic, but that’s actually what I prefer. A lot to high-tech hotel rooms now have controls that basically require a PhD to understand and operate. Sometimes I just want to turn off the lights, and these controls allowed me to do that really easily. Opposite the bed was a flat screen TV atop a TV stand. The TV stand had a minibar built in. The mini bar was well stocked, and is usually my go to place to “use up” property credit if given any. In this case, however, the items were not eligible for the $100 food and beverage credit I received from AMEX Fine Hotels & Resorts. I was a bit disappointed at the lack of a proper coffee maker, though instant coffee in Asia is usually pretty good, so it wasn’t too big of a deal for me. At the end of the room was a nice lounge chair and a work desk. The view wasn’t anything super exciting, with buildings and greenery; I am usually happy as long as I’m not looking at rooftop AC units. The hotel also provided a CD of sleep music, which was a nice touch. The bathroom was off to the side near the entrance, and was almost as big as the bedroom. There was a spacious closet with all the usual furnishings and supplies, including (in typical Four Seasons fashion, very sturdy and substantial) cloth laundry bags, plush slippers, and more hangers than I’d need for myself. The bathroom featured double vanity, which is always a good thing if you’re traveling with someone. The usual amenities, like dental kits, cotton balls and buds, as well as two bottles of water, were provided. There was also a separate shower and bathtub, with ETRO-branded toiletries. They smelled really great, though didn’t seem to be the same line line or scent as the ones at the Lufthansa First Class lounges. The toilet was in a separate room within the bathroom, which also featured a bidet. I decided to take a quick dip at the hotel plunge pool, and was pleasantly surprised that there was nobody there. The pool was a nice size, though not really designed for swimming laps (more on that later). There was an abundance of pool chairs from what I could tell, as well as a few mini cabanas. There was also a hot tub at the other end of the pool area, though I didn’t go in. I took one of the cabanas, and the pool attendant came by to offer a glass of (very delicious) iced tea, on the house. The bar area wasn’t open, but had sunscreen for people like me who forgot to bring any. There was also a variety of newspapers if you just want to relax and read. The buffet breakfast was included as part of my AMEX Fine Hotels & Resorts booking. Breakfast was served in the One-Ninety restaurant, which was located off the lobby. It was a pretty extensive spread, as one would expect from a luxury hotel in Asia. There were both hot and cold options, and was pretty equally split between Asian and Western cuisines; all the options I sampled were very high quality. Rather than walking through the buffet in text, I’ll just let the pictures speak for themselves. Since I was traveling by myself, and was only staying in Singapore for one day, I was actually struggling to use up my $100 food and beverage credit (this is one of the main reasons why I never value them at face value). I had a nice dinner at One-Ninety on my first night there, and used up the rest for room service for lunch on the second day. It actually worked out well, since it started seriously pouring around 1 pm, so it was nice that I didn’t have to go outside for lunch. I ordered Wonton Soup and Char Kway Teow, which are two of my favorite dishes, ever. I usually prefer the renditions from food markets, but I was curious to see taste what a 5-star luxury Char Kway Teow and Wonton Soup would be like. Maybe some of the quality was lost from this being room service, but the dishes were not good. (To be honest, I’d describe them as bad.) The kway teow was far too dry, and the wontons were clumped together, like they were frozen and simply tossed in a boiling pot of broth, without so much as a bit of stirring. Presentation, though, gets high marks. Ok, I didn’t actually experience the spa, though I did experience the locker rooms of the spa and health club facilities. You see, Fine Hotels & Resorts offers guaranteed 4 pm checkout, and since my flight from Singapore wasn’t until midnight, I took full advantage of the late checkout. The associate who checked me out asked what time my flight would be; upon finding out, she invited me to come back and freshen up at the spa with a shower before heading to the airport, which was really thoughtful. The spa/health club had a nice seating area, with some light snacks and fruit/herb-infused water. I don’t usually take pictures of the locker room, for obvious reasons. Though in this case they were 15 minutes from closing, and there was absolutely nobody. With such a nicely appointed locker room, I decided to snap a few for this review. I also took a quick peek at the gym, which had a nice variety of equipment. 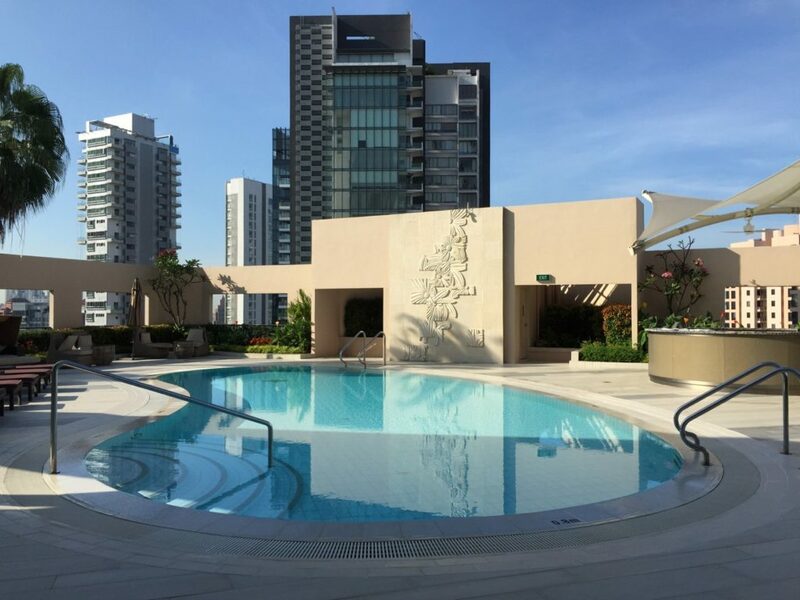 Singapore’s hotel market can be frustrating in terms of using points and cash—the redemption rates are high, and the cash rates aren’t usually cheap enough to make paying cash the obvious option. In this case, booking through Fine Hotels & Resorts worked out for my one-night stay. The Four Seasons Singapore has a really nice location that’s close to the main shopping street, while preserving a high degree of privacy. The grounds are well appointed, and I liked the “classical luxury” decor. The staff members were friendly, and I especially appreciated the proactive offer for me to use the spa/health club facilities, even after I had checked out. The room was spacious, and the bathroom had a great shower and tub. The breakfast was amazing, though it’s not something that I’d say is unique to this hotel. In many ways, the Four Seasons Singapore felt like the Singapore hotel market to me. It’s a good hotel by any measure, but nothing about it made me go “whoa, this is amazing.” I was more than happy about my stay, and will definitely consider returning if the rates are good. Video: Did TSA Handle Screening of Cancer Patient Inappropriately?